Congrats to the 6th, 7th, and 8th Grade Track Teams! CYO 7th Grade Champions! 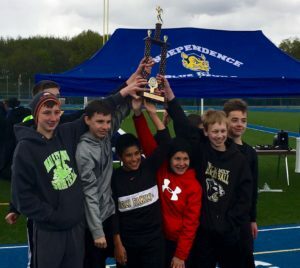 Over the weekend, despite some horrible weather, the Holy Family Track Team had a great weekend of meets! The 8th Grade Girls and Boys took 3rd at their Districts meet which consisted of 10 Teams. It’s also important to mention the 8th Grade Girls took third with only 2 girls competing! The 6th & 7th Graders had their Championships on Sunday.